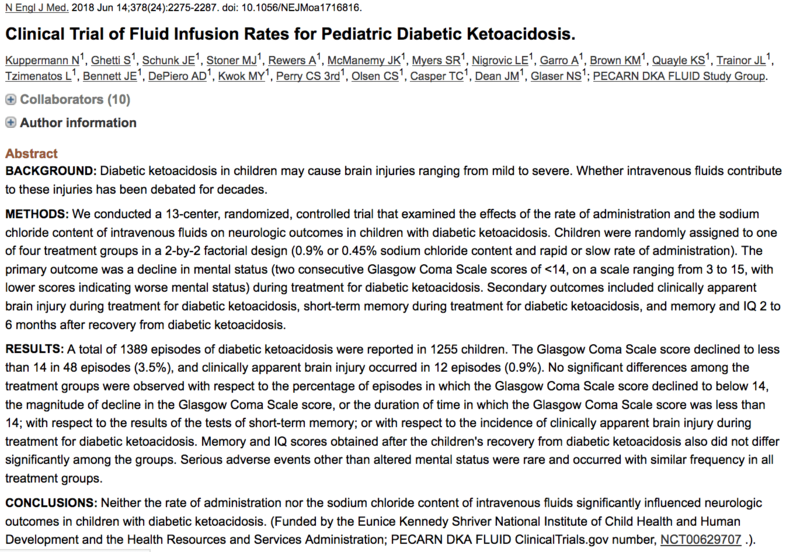 Over the years I’ve had some interesting, and not entirely positive interactions when treating diabetic ketoacidosis in kids. These usually focus around some very strongly held views that unless you do exactly what the other person believes to be right then you are trying to kill the child. That may seem a little dramatic, but having been ‘incident form’d’ for various aspects such as giving too much fluid, too little fluid, too much insulin, too little insulin, too fast, too slow or…… well most things really. The point is that this is a condition that generates very strong beliefs and emotions amongst all of us who operate in paediatric practice. In the UK we use the very well written BSPED guidelines1 which are evidence based (at the time of writing) and which advocate replacing the calculated fluid deficit over 48 hours. Go too fast and it’s likely that you will be reported. Central to many of these beliefs is the concern around the development of cerebral oedema as a life changing complication of DKA. The basis of this concern seems to rest on the idea that rapid fluid shifts into cells as a result of aggressive resuscitation with fluids is more likely to result in cerebral oedema and therefore harm. This belief is well entrenched in endocrine emergency management and is typified by review papers like this well written one from 20022. There is a reasonable pathophysiological argument to support this belief. DKA takes a long time to develop and it does lead to significant biochemical changes in all fluid spaces. Consequently there is a certain elegance in the argument that the treatment should also be gentle to allow homeostasis to adjust at a pace that the cell mechanisms can cope with. It makes sense to be cautious with fluid and thus sensible to go slow. However, pathophysiological argument is no respector of reality and in recent years the belief that cerebral oedema is caused by fluid administration has been questioned, or not found to be associated with its development3–7. Well I say recent, Damian Roland on the DFTB blog8 notes that it’s 17 years since it was questioned in the NEJM. Dogma is difficult to overcome we all know and there is no doubt that the link of fluids to oedema are treated as dogma by some. This week sees a really interesting paper, a randomised controlled trial in the NEJM9, on precisely the question of whether the rate of fluid administration influences the incidence of cerebral oedema. Previously both the view that there is a link and the subsequent observational data to refute it has come from case control and retrospective cohorts. Whilst this can suggest a causality (or not) they are methodologically no substitute for a randomised controlled trial. Children (remembering that in the US that usually means up to age 18 and not 16 as in the UK) with DKA across 13 centres. TO be enrolled they had to have ablood glucose level of >300 mg per deciliter [16.7 mmol per liter] and either a venous pH of <7.25 or a serum bicarbonate level of <15 mmol/L. You can read more about the protocol in this article published in 200310. The trial used a 2×2 factorial design which allowed them to compare not just a difference in the speed of rehydration but also the type of fluid used. This design also helps to understand if there is an interaction between the two treatments11,12. What were the differences in treatments? Fast regime – Up to two 10ml/Kg fluid boluses. Rehdration of deficit within 36 hours with half within the first 12 hours. Slow regime – Only one 10ml/Kg bolus. Rehydration of deficit over 48 hours. The primary outcome was the deterioration of neurological status. This was defined as the patient dropping their GCS below 14 at any point within the first 24 hours of treatment. They also looked at memory, cognition and ICU interventions. OK. They managed to randomised 1255 patients which is pretty impresssive as it’s not the most common disease we see. There was a good spread of illness severity between the groups and good adherence to protocol. The headline figure is that there was no difference between the 4 regimes. In terms of the main outcome of a decrease in GCS then it did not seem to matter which regime was used, and in the more detailed tests of memory and cognition there was again no significant difference found. This is an important study that gives suggests that the rate of fluid administration is not as pivotal in the development as we thought, but there are caveats. As pointed out on the DFTB blog, this is still quite a heterogeneous group of patients with perhaps less visibility of the very young and very sick in the cohorts. Those are the patients in whom risks are higher and we cannot see into those sub groups. A significant proportion of patients (about 280) were removed by the treating clinician. That’s quite a proportion that we would want a little more information on. The incidence of brain injury was really low in all cohorts and this trial is not big enough to reliably tell us whether there is a difference for an event with a 2-5% incidence. That could still be important. The power calcualtion is not in the original paper, but it is published in the protocol from 2003. It’s a bit complex but in essence the sample size was determined based on the idea of identifying a 7.5% difference in treatment outcome for a drop in GCS. They also made an estimate of cerebral oedema occuring in about 20% of high risk patients and in the study the incidence appears to be half that. In other words they were looking for a big difference from a higher incidence than they found. After quite a few twitter conversations it’s worth mentioning that the decision to use 0.45% or 0.9% is about replacing the dehydration. In addition the patient still needs their maintenance fluids on top of this and regimes for this vary across different health economies. So can I stop worrying about rehydration speed in DKA then? Absolutely not. Remember that these regimes are still slow as compared to your resuscitation of septic patients and a whole range of other conditions. DKA is still a special circumstance and as the evidence stands all of the regimes here are long. You still need to be careful with fluids and be mindful of the potential iatrogenic harm you might do. There is a counter argument to this being a relaxation of concern in that there is no difference in outcome. In other words if you are currently using the BSPED guidelines then there is little convincing data here to change practice, and there is also the argument that keeping consistency in management is also a good thing. The authors make an argument for the use of 0.45% rather than 0.9% saline and there are trends to demonstrating a benefit in the results, and there is a reduction in hyperchloraemic acidosis in the 0.45% group, but these do not reach statistical significance and so it is a weak recommendation. In the BSPED guidelines 0.9% Saline with 40mmol/L potassium is advised. This is a large, multicentre, RCT in children to investigate a controversial and emotive area of emergency care. That is no small undertaking and demonstrates that it can be done. We should not simply decide that such research is too difficult or too ethically challenging to carry out in children. This study and others by the PECARN group and our own PERUKI13 organisations demonstrate that it can, and indeed must, be done. Further thoughts on this trial from our friends and colleagues. Management of paediatric DKA. BSPED. https://www.bsped.org.uk/media/1381/dkaguideline.pdf. Published 2017. Accessed June 17, 2018. Lawton B. Sweet and Salty – fluids in DKA. Don’t Forget the Bubbles. https://dontforgetthebubbles.com/sweet-salty-fluids-dka/. Published June 15, 2018. Accessed June 17, 2018. PERUKI. http://peruki.org. http://www.peruki.org/. Published 2017. Accessed June 17, 2018. 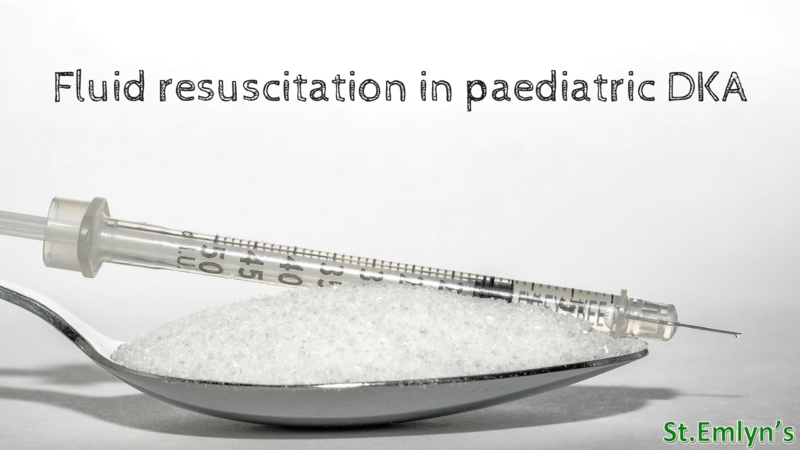 The Rate of Resuscitation in Pediatric DKA. Emergency Medicine Literature of Note. http://www.emlitofnote.com/?p=4222. Published June 14, 2018. Accessed June 17, 2018.